My last post fêted the charms of Guarda Cabernet Franc, produced by Bodega Lagarde in Mendoza. It proved such a surprising and enchanting wine that I decided to do a little more sleuthing and track down other specimens – if I could find them. A bit harder than it sounds, I assure you! Lucky for me I was in New York City and had ready access to some really great wine shops. Just two blocks away, Mr. Wright Fine Wines has provided the perfect accompaniment to many a dinner, and I hoped they would have an Argentine Cab Franc I could try. Using their online inventory search I found an intriguing bottle by Bodega Aleanna, El Enemigo (The Enemy.) Come on, you know there’s a story there, right? Turns out, there is one. The 2011 El Enemigo comprises 92% Cab Franc and 8% Malbec from vineyards in the Gualtallary subzone of Tupungato, at the north end of the Uco Valley, a region regarded as one of the rising stars of South America. About an hour southwest of Mendoza, Gualtallary is renowned for its high altitude and deep, rocky soils with veins of limestone running through them, resulting in wines of elegance and complexity. The wine is aged in 100-year-old Alsatian foudres that have been retoasted, a method Vigil believes enhances the true character of cool climate Cab Franc, which is fresh and acidic, with a noticeable herbal component. I noticed all those elements when I finally opened the wine. It looked like young Bordeaux – deep red/purple in color, all the way to the edge. And it smelled like Bordeaux, rather buttoned-up, with its aromas of currant and cedar. Did it taste like Bordeaux? Yes and no. Yes, the black currants tasted familiar; and the slightest herbal hint – thyme, maybe? – was just right too. But there was a lot more: blackberry, bay leaf, and licorice, oh my! And somehow it seemed like I was just scratching the surface; that if I tried it again five, ten years from now, it would have an entirely new dimension. Patricio Tapia, who reviewed several Cab Francs from South America for Decanter in January 2016, labeled it as midway between at Saint-Émilion and a Chinon. I think that’s an apt description. Suffice it to say, these wines are definitely worth seeking out. If you’ve yet to try a Cab Franc from Argentina, see if you can track one down at a shop near you. It will be an entirely new experience! My next tasting experiment is going to pit one of these Argentine wines against a sample from the Loire Valley and another from Saint-Émilion. Let the Cab Franc love begin! Note: Bodega Aleanna’s El Enemigo line includes varietal Chardonnay, Malbec, and Bonarda wines, as well as a Syrah/Viognier blend, à la Côte-Rôtie. 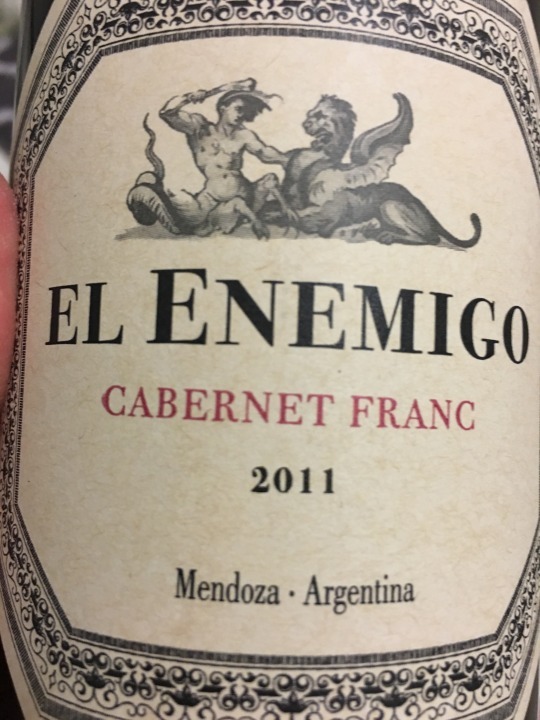 The winery also produces two other Bordeaux-style blends, both heavy on the Cab Franc: Gran Enemigo Gualtallary, from the same neighborhood as the wine I tasted for this article, and Gran Enemigo Agrelo, which comes from grapes grown in the Agrelo area of Luján de Cuyo. Both are crafted in a style reflective of the wines of Pomerol, on Bordeaux’s right bank. References:Robinson, J., et al. The Oxford Companion to Wine, 2015. Goldstein, E. Wines of South America, 2014. Previous It’s Cab Franc Friday! So Let’s Go to – Argentina?